The above piece from a beautiful Persian painting is available on 3 sizes. You can order it on high quality photo paper, or on canvas. Canvas prints can be gallery wrapped and/or framed. Gallery wrap is the process of stretching the canvas print around a wooden frame for easy hanging. We also offer elegant frames on all canvas wraps. To learn more about different options to order this beautiful art print, see the pictures below and then to place your order, select the correct style from the above Drop-Down menu or call us to place your order by phone. 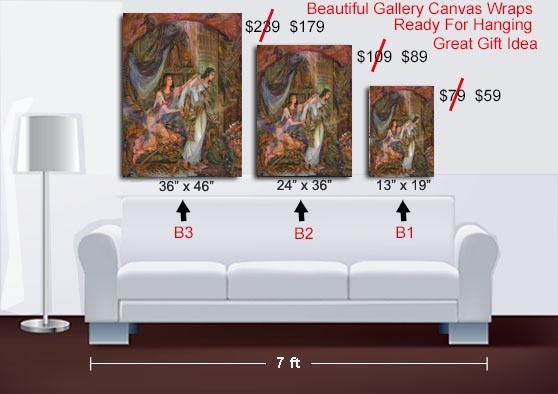 We highly recommend you order this beautiful Iranian painting on Canvas Print With Gallery Wrap (Option B1, B2, or B3 from the top drop-down menu). The canvas wrap prints look like the artist's original oil painting and will really look great on your home or office wall. With holiday seasons right around the corner, why not order a canvas wrap and give it as a gift. It will last forever! This is a very rare art piece and you will not find it anywhere. 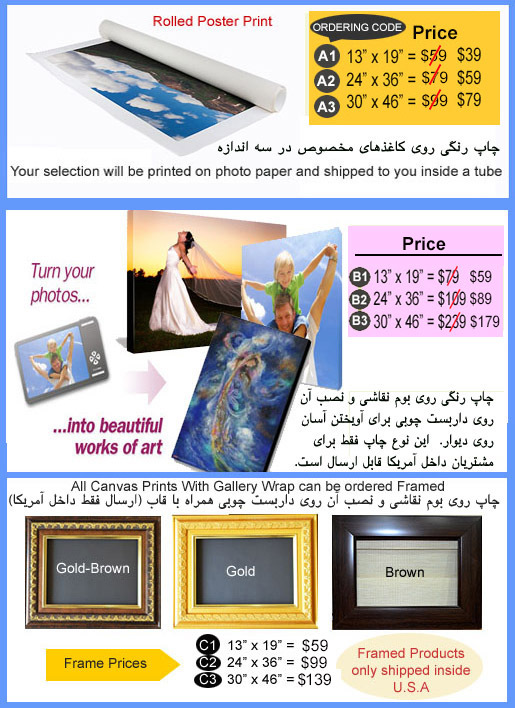 Similar art pieces printed on canvas and gallery wrapped are sold online for much higher prices. We guarantee our price to be the lowest you will find anywhere or we will pay you the difference! We will package your order nice and secure and will ship it to you within 5-7 days! Don't Wait. Order It Now. Due to the size and weight of the canvas wrap, we only ship to addresses inside U.S.A but if you live outside of U.S.A and would like to order this or other art pieces you see on this site, please email us 1st and we will quote you the correct shipping cost. Of course, if you are ordering this piece on Photo Paper Print (options A1, A2, A3), we can ship it to you worldwide.